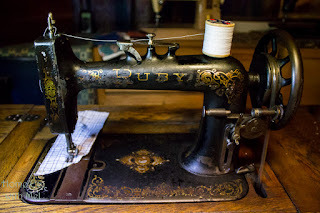 Hello everyone, I thought maybe today we would discuss some of the basics of using a treadle sewing machine. 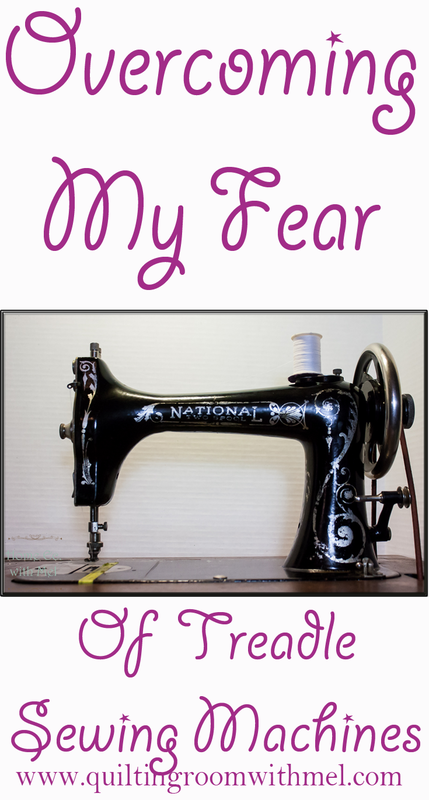 Not just the skills and techniques but also the fears,anxieties and intimidation that I found to be so common as I was trying to incorporate what I knew about vintage sewing machines into a language my antique sewing machines would understand. Leaving me with all of the essentials needed to become a successful treadle operator.Some of you will be able to completely relate to what I am referring to and some of you will be the lucky ones who are able to learn new things with out a near nervous breakdown. Not everyone learns the same way and as I delve deeper into how I evolved into treadling please remember that I am referring only to my own personality and my own personal experiences.So if you find that my stories fit into your experience then you will realize your are not alone.If not, you are still not alone and you get to giggle and laugh at my struggles. Either way I am still sharing knowledge and teaching about the hobby I enjoy. When I was a newbie I thought it was so simple looking that there was no reason to embarrass my self and ask simply, How do I treadle ? I mean it was intuitive push on the top of the bar then on the bottom and it would be smooth as glass. Yeah right, my poor machines went forwards and backwards with ease. It didn't take long to leave behind the ideology that real treadlers never role the hand wheel to get it started the right direction. Actually the first machine belongs to my wife, I bought it for her, then after we cleaned it all up and had it smooth mechanically I had to give it a go and was addicted immediately. It is a National,Vibrating shuttle machine made for the Cash Buyers Union and labeled as an "Arlington". When a shuttle machine spins backwards after about a half of a rotation it becomes a very proficient thread clipper. So not only do you re-thread the bobbin but also the needle. EVERYTIME. Eventually I was able to get a couple stitches down without cutting off the threads. I still didn't understand the physics involved with foot control on the pedal. At Mel's urging I googled for proper foot position, only to find several different techniques employed by many different accomplished treadlers. I tried both feet center of the pedal rocking both feet toes first then heels down. This technique was uncomfortable for me and I soon tried different styles. eventually I found I could do OK by just using one foot in a hybrid style pushing with the leg and rocking the heel toe at the same time. It worked for me for short seams but as they go longer I had trouble with fatigue. I kept practicing and sewing small projects. By this time our herd had started to grow I had bought myself a fantastic Montgomery Ward, Damascus Grand Rotary,also a badged National made machine.I had been gifted a 1895 Singer 27 that had been factory converted to electric in the mid 20's. By the time I got it poor thing had sat for over 50 yrs and was frozen solid. I got it to move and sew, I removed the conversion, and set her into a treadle table.Still doing the one foot treadle pump. My sewing and quilting skills were growing fast. When I started free-motion quilting it quickly became apparent that one footed for me was not smooth enough or fast enough for the job. I happened upon a woman quilter who explained how she positioned her feet, I adopted her technique and have never regretted it. My dominant foot is my right foot so I put it at the top of the pedal on the very edge,my left foot goes onto the lower left corner with the ball of my foot riding on the edge of peddle. I finally found the proper technique for me, my treadling is so much smoother and more controlled at all speeds.I wish I would have started out as a newbie using this technique. If I was to start over this would be one of three things I would do differently. The second thing I would do differently would be to remove the needle and the bobbin and practice empty until my feet found the groove and I could keep forward momentum while practicing. Last of all practice starts and stops precisely at all speeds. Go as fast as possible but also go as slow as possible. when you are comfortable then thread it up and go for it. I will only say that failure is as good a teacher as success,So if you are a beginner or novice maybe some of this will help you, if you are an accomplished treadler I hope it brings you a smile.fond memories and a good laugh. 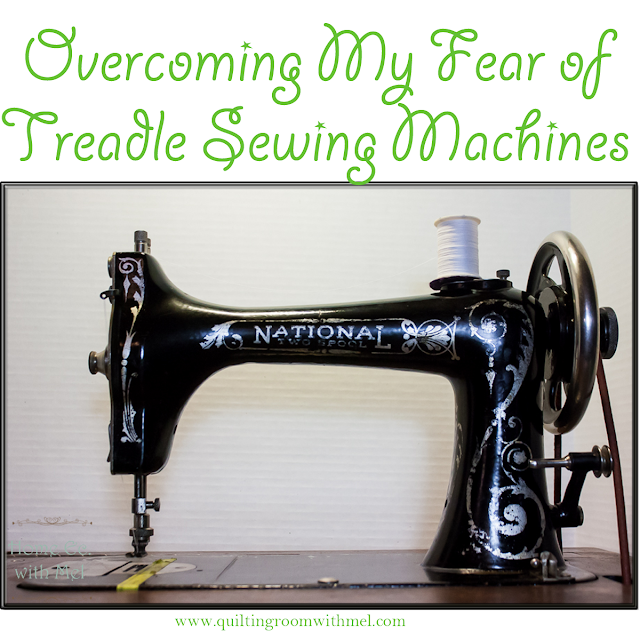 If you enjoyed this post you might enjoy all of our treadle sewing posts. You can learn more about our vintage sewing machine collection as well.